His Preservation of the Torah. Palestinian tanna; born about the middle of the second century, at Kafri, near Sura in Babylonia; pupil of Judah I., and uncle and teacher of Rab. He was a descendant of a family which claimed to trace its origin from Shimei, brother of King David (Ket. 62b). He passed the earlier part of his life in Babylonia, where he married a certain Judith. By her he had twin sons, Judah and Hezekiah (both of whom became renowned rabbis), and twin daughters, Pazi and Tavi (Yeb. 65b). Ḥiyya was unhappy in his married life, for his wife was a shrew. This was so keenly felt by Ḥiyya that when asked by his nephew for a blessing he said: "May God preserve thee from an evil that is worse than death—a contentious woman" (Yeb. 63a). Ḥiyya was especially affected by a trick she played upon him. Disguising herself, she went to him and asked whether the obligation of propagating the human race extended to women; receiving an answer in the negative, she took drugs which rendered her barren (Yeb. 65b). However, Ḥiyya's good nature was so great that he overwhelmed her with presents, meeting the astonishment of his nephew by saying that men should show themselves grateful to their wives for rearing their children and for keeping their husbands from sin (Yeb. 63a). In the latter part of his life Ḥiyya emigrated to Tiberias, Palestine, where he established a business in silks, which he exported to Tyre (Ruth R. i. 17; Lam. R. iii. 16; Gen. R. lxix.). The high reputation acquired by him in his native country had preceded him to Palestine, and ere long he became the very center of the collegiate circle of the patriarch Judah I. Regarding him more as a colleague than as a pupil, Judah treated Ḥiyya as his guest whenever the latter chanced to be at Sepphoris, consulted him, and took him with him when he went to Cæsarea to visit Antoninus (Tan., Wayesheb). His admiration for Ḥiyya was so great that he used to say: "Ḥiyya and his sons are as meritorious as the Patriarchs" (B. M. 25b). Judah's friendship and high esteem for Ḥiyya are connected in the Haggadah with a miracle. In course of a conversation with him Judah said that if the Babylonian exilarch R. Huna, who was believed to be a descendant of the family of David, came to Palestine he (Judah) would yield to him the office of patriarch. When R. Huna died and his body was brought to Palestine for burial, Ḥiyya went to Judah and said, "Huna is here," and, after pausing to notice Judah's pallor, added, "his coffin has arrived." Seriously offended, Judah banished Ḥiyya for thirty days. While the latter was away, the prophet Elijah, assuming Ḥiyya's features, presented himself to Judah and healed a toothache from which the patriarch had suffered for thirteen years. Judah was not longin discovering the truth of this wonderful cure, and his respect for Ḥiyya increased (Yer. Kil. ix.). It was a current saying among the Palestinians that since the arrival of Ḥiyya in Palestine storms did not occur and wine did not turn sour (Ḥul. 86a). His prayers are said to have brought rain in a time of drought and to have caused a lion, which had rendered the roads unsafe, to leave Palestine (Gen. R. xxxi.). Other miracles of the same kind are credited to him. He was especially lauded by his Babylonian compatriots. Simeon ben Laḳish names him after the two other Babylonians, Ezra and Hillel, who came to Palestine to restore the study of the Torah (Suk. 20a). However exaggerated this assertion may be, Ḥiyya was certainly very active in the promotion of learning in Palestine. He founded schools for children and often acted as instructor. It is related that when Ḥanina boasted that he could reconstruct the Torah by logic should it be lost, Ḥiyya said: "To prevent such a loss I proceed in the following way: I cultivate flax, spin thread, twist ropes, and prepare traps by means of which I catch deer. The flesh of these I distribute among poor orphans, and I use the hides to make parchment, on which I write the Torah. Provided with this I go to places where there are no teachers, and instruct the children" (Ket. 103b). Ḥiyya's activity in the field of the Halakah was very extensive. To him and his pupil Hoshea is due the redaction of the traditional halakot which had not been included by Judah in the Mishnah. These halakot are known under the various names of "Baraitot de-Rabbi Ḥiyya," "Mishnat de-Rabbi Ḥiyya," and "Mishnayot Gedolot." Some of them are introduced in the Talmud with the words "Tane Rabbi Ḥiyya," and are considered the only correct version of the halakot omitted by Judah (Ḥul. 141a). Ḥiyya was the author of original halakot also, which he derived from the Mishnah by the hermeneutic rules. Although very conservative, he opposed the issuing of new prohibitions. "Make not the fence higher than the Law itself, lest it should fall and destroy the plants" (Gen. R. xix.). Ḥiyya seems to have contributed to the Sifra the redaction of the tannaitic midrash to Leviticus, where his sayings are often quoted. From the time of Sherira Gaon, Ḥiyya was generally regarded as the author of the Tosefta; but the supposition has been rejected on very strong grounds by modern scholars (see Tosefta). 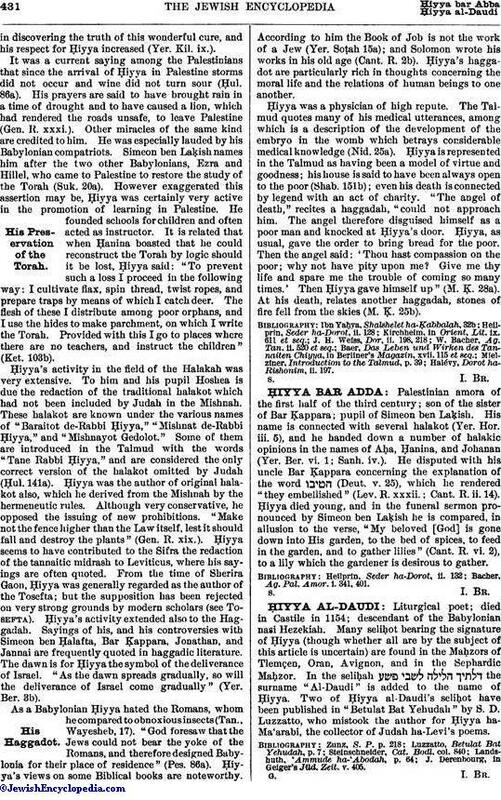 Ḥiyya's activity extended also to the Haggadah. Sayings of his, and his controversies with Simeon ben Ḥalafta, Bar Ḳappara, Jonathan, and Jannai are frequently quoted in haggadic literature. The dawn is for Ḥiyya the symbol of the deliverance of Israel. "As the dawn spreads gradually, so will the deliverance of Israel come gradually" (Yer. Ber. 3b). As a Babylonian Ḥiyya hated the Romans, whom he compared to obnoxious insects (Tan., Wayesheb, 17). "God foresaw that the Jews could not bear the yoke of the Romans, and therefore designed Babylonia for their place of residence" (Pes. 86a). Ḥiyya's views on some Biblical books are noteworthy. According to him the Book of Job is not the work of a Jew (Yer. Soṭah 15a); and Solomon wrote his works in his old age (Cant. R. 2b). Ḥiyya's haggadot are particularly rich in thoughts concerning the moral life and the relations of human beings to one another. Ḥiyya was a physician of high repute. The Talmud quotes many of his medical utterances, among which is a description of the development of the embryo in the womb which betrays considerable medical knowledge (Nid. 25a). Ḥiyya is represented in the Talmud as having been a model of virtue and goodness; his house is said to have been always open to the poor (Shab. 151b); even his death is connected by legend with an act of charity. "The angel of death," recites a haggadah, "could not approach him. The angel therefore disguised himself as a poor man and knocked at Ḥiyya's door. Ḥiyya, as usual, gave the order to bring bread for the poor. Then the angel said: 'Thou hast compassion on the poor; why not have pity upon me? Give me thy life and spare me the trouble of coming so many times.' Then Ḥiyya gave himself up" (M. ḳ. 28a). At his death, relates another haggadah, stones of fire fell from the skies (M. Ḳ. 25b). Halévy, Dorot ha-Rishonim, ii. 197.